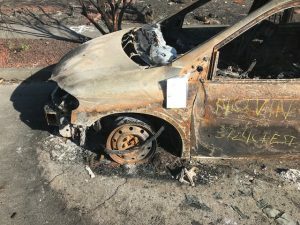 With the Sonoma County Consolidated Fire Debris Removal Program underway, the Santa Rosa Police Department is working with vehicle owners to make arrangements to remove their fire-damaged vehicles from public streets to make way for debris clean-up equipment and operations. Owners are permitted to tow their vehicles off of public streets at this time. Owners who have not yet filed an insurance claim or made arrangements with insurance adjusters are advised to do so ASAP. Fire-damaged vehicles that remain on public streets will be towed. Additional information and timelines regarding fire-damaged vehicle abatement is forthcoming.